According to a new UNESCO report American troops and contractors have caused «substantial damage to the archaeological site at Babylon in Iraq after the 2003 invasion». An illustration in his book Power, Faith and Fantasy – American in the Middle East 1776 to the Present shows American female tourists chipping souvenirs from a column in an ancient Egyptian temple, where they are «saving precious fragments from the ruin to which they are doomed». Dragon carvings on the famous Ishtar Gate have also been heavily damaged. It might be important to mention that parts of this gate is spread across museums all over the world and that the Americans are not the only ones taking bits and pieces back home from abroad. 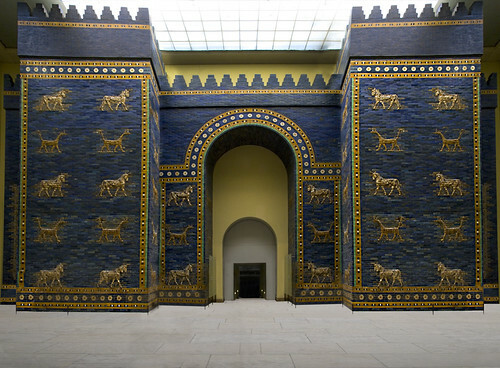 A reproduction of the gate serving as an entrance to an unfinished museum, built in Iraq during Saddam Hussein has also been damaged by the war. The US also stated that the damages and looting in Babylon when under their control would have been worse if they had not been there at all. A bit hard to believe when Donald Rumsfeld, Defense Secretary at the time, stated on the looting in Iraq after the invasion that «stuff happens» and that the looting was a «part of the price» for the liberation of Iraq. With such a mindset from the very top it is hard not to see «the disrespect that Americans displayed for the classical past». These damages are a violation of the the 1954 Hague Convention for the Protection of Cultural Property in the Event of Armed Conflict and the notion of military necessity, but this convention is usually ignored during war and conflicts the world over. Some of the damages to Babylon can be seen here. About one dozen trenches, the largest 170m long, and about one dozen cuttings, have been made both into previously undisturbed archaeological deposits and into tips or mounds from earlier excavations. In these trenches were found pottery (including a complete vase), bones and fragments of brick with cuneiform inscriptions. About 300,000 sq. metres of the site have been covered with gravel, sometimes compacted and chemically treated, to be used as a helipad and to create spaces for vehicle parks, accommodation, storage, etc. All the gravel has been brought in from elsewhere, and will in due course work its way into the archaeological deposits, irrevocably contaminating them. Around the site are thousands of sandbags and HESCO barriers that were originally filled with earth scooped up from the Babylon archaeological site (the presence of sherds and bones in the bags is a testimony to the archaeological nature of the deposits used) and from 3rd November 2003 onwards filled with sand and earth brought in from outside Babylon, sometimes no doubt from archaeological sites, thus exacerbating the problem even further. In many parts of the site are wheel marks deriving from the movement of heavy vehicles, and damage is also likely to have been caused by the extensive helicopter traffic at the site. There is evidence of environmental pollution (fuel seepage) in the area of the Fuel Farm. This is likely to have a deleterious effect on the archaeological deposits beneath. There is damage to 9 of the moulded brick figures of dragons in the Ishtar Gate, in one case serious damage to the body of the figure. The brick pavement in the south part of the 6th century BC Processional Way has been broken by driving a heavy vehicle along it. Parts of the roof of the (reconstructed) Ninmah Temple have collapsed. No End in Sight is an award-winning American documentary from 2007 on the current war in Iraq. It provides a chilling portrayal of the Iraqi war and the incompetence and ignorance of the inner circle of the Bush administration. The main focus of the film is the two months before the invasion in March 2003, and the two-three months after. It views this period as the most critical with the looting of Baghdad, the insufficient number of American soldiers, the lack of planning the war itself and the decisions that would create the insurgency. It tells the story of a leadership bent on a quick fantasy war with virtually no real plans for the aftermath. During World War II the United States started planning the occupation of Germany two years in advance, but the Bush administration didn’t create the organisation that would manage the occupation of Iraq until 60 days before the invasion. It shows a leadership who did not listen to and ignored its own wide range of military and political experts and appointed people with no knowledge of Iraq or the region, who did not speak any Arabic and who had almost no contact with neither Iraq nor the Iraqis themselves. Some barely visited Iraq. Overnight Bremer rendered unemployed, and thereby infuriated, half a million armed men. Equivalent to firing over five million people in the United States. And so these men rather than helping to prevent an insurgency, in stead created one. The documentary basically sums up of all the main controversies and criticism around the war. In that regard is does not really offer anything very new, and if you have followed the war you have probably heard most of it before. The interesting thing, however, is who you hear it from, and how it connects the dots. The people interviewed is a number of high-ranking officials, diplomats, experts, former soldiers and journalists; many who were deeply involved in planning both the war and the occupation itself. They are what the documentary trailer calls «the ultimate insiders». The director of the film is Charles H. Ferguson, an originally supporter of the war with a Ph.D. in political science from MIT. This is his first film. The documentary has recieved very good reviews since its release in January 2007. Time Magazine called it «without question» the most important film you could see in 2007. A very recent review in the Norwegian edition of Le Monde Diplomatique described it as one of those documentaries that might really influence public opinion (in the US) or even change history. No, I am distinctly not comparing anyone to Hitler, but I cannot help being reminded of the stories of him in his Berlin bunker, moving nonexistent troops on a map, and issuing orders to dead generals.